About eighteen months ago, I began creating monthly prayer lists for my family. It has been such a blessing to go to God with specific requests for my husband and daughters and then see how He has worked in all of our lives. 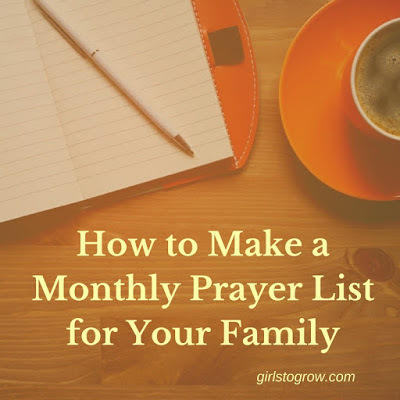 Today I wanted to share with you how I generate this prayer list each month. While there are certain things I want to pray about every day – physical safety, spiritual growth, protection from temptation, future plans/spouses for our daughters – I realized that I was sometimes missing the basic, day-to-day issues they were facing. To remedy that, I decided to make a monthly prayer list for each family member. On the first day of each month, usually during my morning devotional time, I sit down and write out my list. I limit it to five items per person – otherwise it could get very long! If I can’t think of five requests on that first day, I may leave one or two spots empty, but I make sure they’re all filled in within the first three to four days of the month. I write the list in my basic notebook, which is also where I keep my gratitude list and jot down any Bible verses I want to meditate on. However, my current notebook is almost full, so I’ve thought of ordering something like this pretty journal to use next. I think it would make me happy to open that every morning! As I sit down to make my prayer list, I go through the following steps. I try to be very specific when I come up with each request. 1. Break the prayer requests down into categories. Most months I try to balance my list with one request in each of the following areas: spiritual, mental, physical, emotional, and social. This allows me to cover almost every aspect of their life in prayer. However, some months I may know of more needs in one particular area than another, so I don’t stress about having to include all of the areas every month. 2. Look at the calendar. I keep my calendar on my phone, so I quickly scroll through the month to see what’s scheduled. I’ll notice if my husband has a business trip, if one of the girls is traveling for a ballgame or a fine arts performance, if we have a doctor’s appointment or family event planned, etc. 3. Think about issues your family may be facing in the next thirty days. There may be things that aren’t on my calendar, but that I know we have coming up in the month ahead. Maybe someone in the family needs wisdom for a decision, or perhaps a transition is coming up in a particular area, or a relationship needs some help, or discernment is required in a certain situation. 4. Focus on goals a family member wants to achieve. Whether it’s making it onto a sports team or auditioning for a choir or choosing healthier foods to eat, I consider what each person hopes to accomplish. I also may choose to pray for opportunities for them to serve (i.e. playing the piano or helping in a children’s ministry) or for them to be able to use their gifts and talents to bless others. 5. Include a character trait or habit that your spouse or children need to develop. From reading their Bible to being patient with a sibling to exercising self-discipline, contentment, or gratitude, I can usually think of a quality that would be helpful for them to continue to grow in on a daily basis. Without sharing too much personal info, here’s an example of what a typical list might look like for one of my daughters. One of the many blessings about making these monthly prayer lists has been seeing direct answers to prayer. This monthly prayer list is just one way we can continue to pray for our families. If you have another method that you use, I’d enjoy hearing about it. You never know when I might want to switch things up! I'm so glad you shared this! Praying for my family is a wonderful thing to do, but I didn't know where to start. Now I do. Thank you!! You're welcome. 🙂 I've found that this helps me better focus my prayer time and keeps those important needs I want to pray for at the top of my mind. I really like the idea of a monthly focus. I like how you break down the categories to cover more areas of their life as well. Thanks, Janet! Having a monthly focus does seem to help me get more of a grasp on what's going on in each of their lives on a daily basis. I also love being able to tell one of them that I prayed about a certain thing and that God answered that prayer! These are great ideas! I hope to apply this to praying for my husband and son! Thanks for sharing! Thanks for your comment! Hope this is a helpful prayer method for you. This is such a creative idea! Thank you! I have such a hard time organizing my prayer life so this is helpful! You’re welcome – glad you found it helpful! !